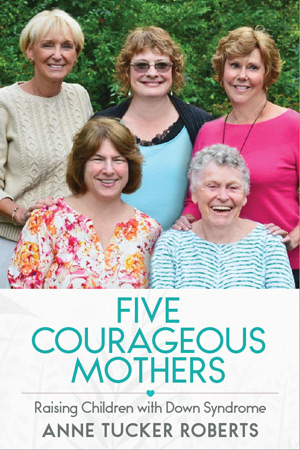 Five Courageous Mothers: Raising Children with Down Syndrome | Omni Publishing Co. I spent nearly 20 years teaching adolescents with Developmental Delays. Each student spent six years with me mastering new skills for adulthood. Along with the students, I worked steadily with their parents preparing them for their child’s graduation from school and into Adult Services. I thought I understood Down’s syndrome. But, it was on an ordinary car ride on an ordinary September day that I learned the extraordinary backstory of one remarkable student, Edward. His mother, Hazel, laughed heartily, regaling me with stories of raising him. One story was memorable. When Edward was young, she explained, she would saunter around the living room, dressed as an old lady, creating stories and speaking with an Italian accent while Edward looked on. Why? These antics, she thought, would increase his attention span, while teaching him words. Intrigued, I asked what made her do this. And here was the shocker – a reality about most of my students with Down syndrome that I didn’t know. At Edward’s birth, the hospital staff and Hazel’s family urged her to institutionalize him. They all agreed with the doctor’s dismissive comment, “Down syndromes don’t learn anything.” Instead, she took Edward home. It is Hazel’s astonishing story of creativity and perseverance that needed to be told. Other mothers of my students offered to tell me their story. They, too, took their infants with Down syndrome home when families and doctors counseled them otherwise. There was no Doctor Spock for them to consult. “Early Intervention” hadn’t been coined and very few in the medical field could even offer “Best Practices” for dealing with obstacles. In fact, a healthy life for their children was a looming question mark. These remarkable women tell of navigating the world of unknowns with challenging fits and starts. In listening to them, the thread between them became clear. These women are the courageous pioneers for what is in place today. They are the quiet heroes in neighborhoods like yours and mine. They didn’t carry on about SAT scores or even dresses for the prom. They weren’t worried about their teen drinking and driving but about them thriving. Meet Hazel, Connie, Ann, Lisa and Jane. Their stories of tenacity and love inspire even the bravest of us.